Stylized after a Lydia Bastianich recipe. 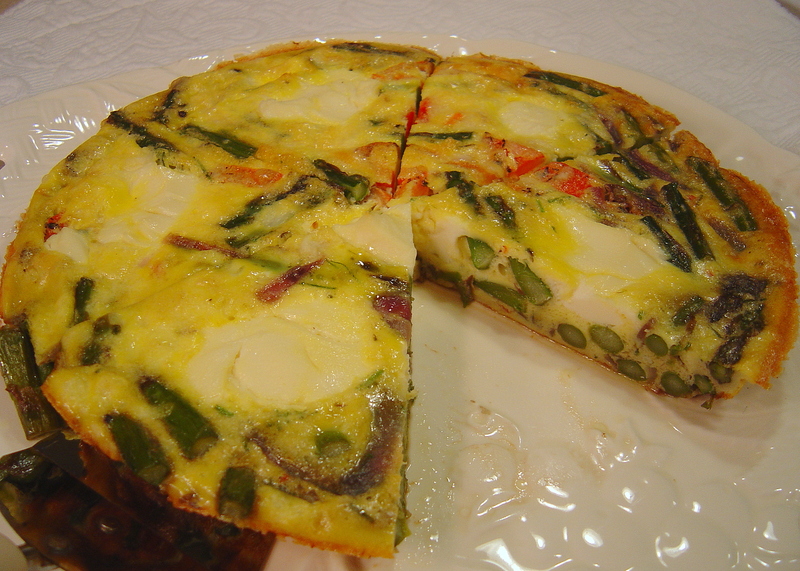 I saw her show and she made a tomato and ricotta frittata and afterwards an asparagus and pepper scramble, although hers was made with raw pepper. Both looked tasty, so I combined the best of both worlds. Makes a great easy breakfast or brunch item, although Lydia says it is often served for dinner in Italy. I could do that. Serves 2-3 depending on how many eggs they like, but sliced into wedges, it could serve 6 as part of a brunch buffet. I was inspired to make this some weeks back after Bill and I spent an evening watching the telly, which I don’t often do anymore. The remote parked on PBS where we watched part if a show by Lidia Bastianich on Italian cooking. I love Lidia- she is so sensibly simple with her cooking, and it makes sense. The evening we were watching, Lidia was preparing egg dishes and did a couple demonstrations. 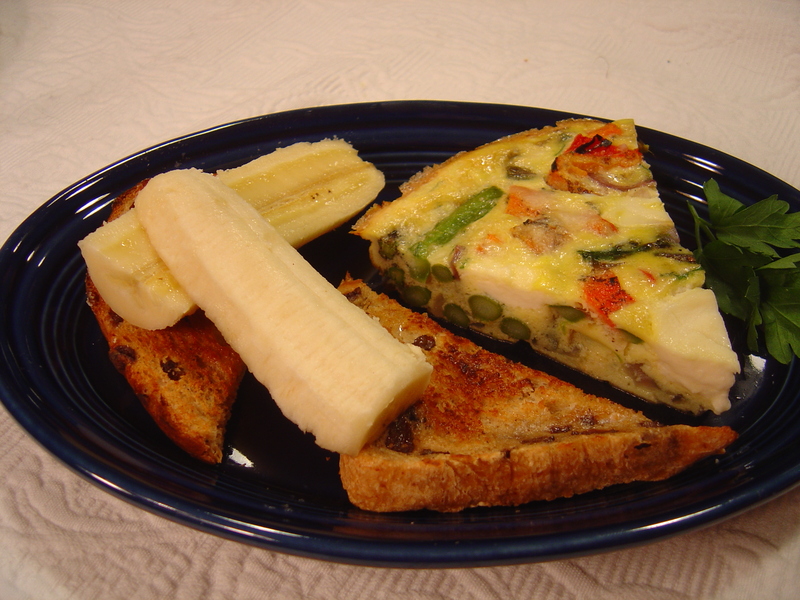 One was for a “Tomato and Ricotta” frittata and another was for an “Asparagus and Pepper” scramble. Her scramble was made using fresh sweet peppers. It looked like she was using Italian sweets rather than your garden variety of red bell peppers, and I very much approve. Both of her demonstrations had Bill and I drooling! She went on to add that Italians often eat eggs for dinner as their entree. I co do that, I thought, especially on a sunny terrace somewhere outside of Rome. But I digress. For this recipe I have combined the best of both worlds, at least in thinking of her dishes on that particular show. But I also do cook freestyle in the kitchen- it’s the way things are meant to be. Should you be inspired by this recipe, please feel free to try it with new ideas! 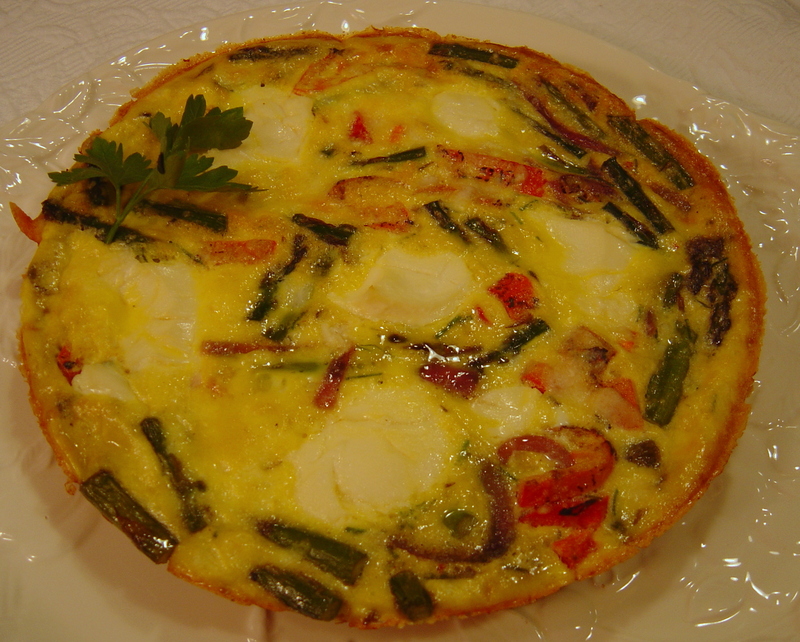 This frittata will serve 2-3 depending on how many eggs your guests like. But sliced into wedges, it will serve even more as part of a brunch buffet, combined with other offerings. Heat butter in a 10-inch oven safe nonstick skillet, and add onions, cooking until they wilt. Add asparagus, season with salt and pepper and add chives, cook for one minute; add 1/4 cup hot water to skillet and continue cooking until water evaporates, about 2 minutes more. Add pepper slices to the asparagus and mix. Pour beaten eggs evenly over vegetables in the skillet. Add 6 dallops of ricotta cheese to the frittata, evenly spaced- you don’t really have to measure the cheese, it’s not that important. Sprinkle the top with Parmesan and place oven safe skillet in the oven (do not broil). Bake for about 25 minutes or until set. 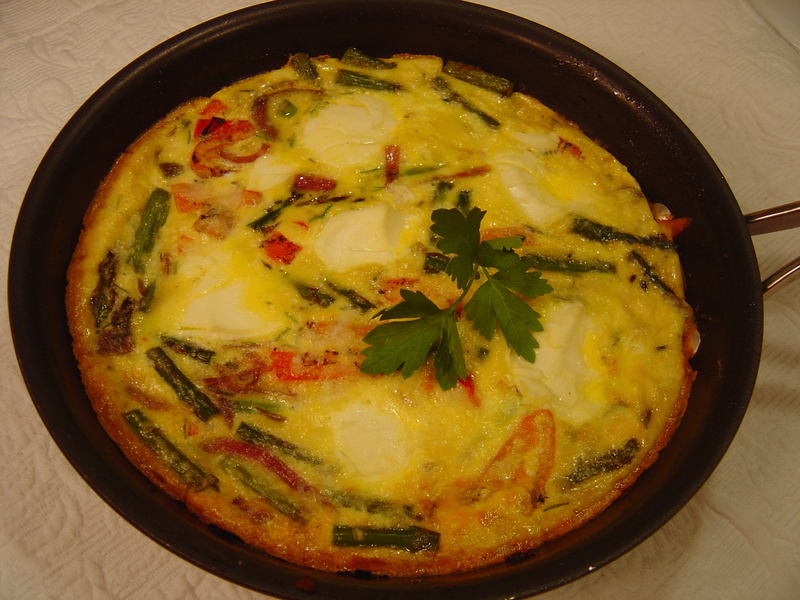 Allow to cool in the pan for 10-15 minutes, then loosen sides if needed before sliding the frittata onto a platter.